Ollie Humphries hit a hat-trick as the young Rocks chalked up a 4-0 Alliance Under-19s League win over Woking at Nyewood Lane this afternoon. It means the goal-hungry home side maintain their position at the top of the table and in so doing took their total to 32 goals scored in just five matches. Striker Humphries cashed in on two mistakes in the visitors' rearguard to net his first on 25 minutes and again five minutes later. Jamie Carroll, who has been a sub for Jack Pearce's outfit several times so far this season, made it 3-0 just before the break. A dominant home side could have easily gone in at the break with a bigger advantage but for missed chances. Humphries, currently playing his football at SCFL division one side Selsey, made hit 4-0 on the hour to bag his treble. Bognor controlled large periods of play with decent possession. Joe Clarke showed great awareness and ability alongside Harley Bain in central defence, while Liam Brady caught the eye going forward. 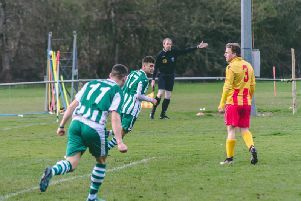 Rocks secretary Simon Cook said he was pleased with the performance and also the fans who turned up to cheer on the team. He said: "It was a convincing display and all involved are to be congratulated. We make these games free entry and we're starting to get more and more supporters come down to get their midweek football fix, and long may that continue." Before today's convincing victory, the youngsters have beaten AFC Wimbledon 7-2, Met Police 8-2, Aldershot Town 3-0 and Corinthian-Casuals 10-0.